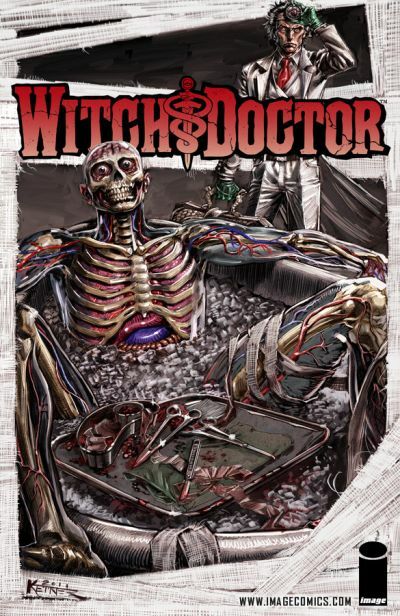 Much to fans’ delight at San Diego’s Comic-Con in July, newcomers Brandon Seifert and Lukas Ketner announced that the summer’s medical horror smash hit will return this December with a one shot tale of black magic and organ-swapping in the upcoming WITCH DOCTOR: THE RESUSCITATION. Offering a great jumping on point for new readers, WITCH DOCTOR: THE RESUSCITATION will ask important questions of its readers. For instance, if you wake up in a bathtub of ice with a surgical incision on your side, but the hospital says you’ve still got two kidneys, where do you go for a second opinion? To the expert, Dr. Vincent Morrow, WITCH DOCTOR, of course! WITCH DOCTOR: THE RESUSCITATION, a 32-page full-color medical horror one shot comic for $2.99, will be on sale in stores December 14 and will be available for order in the upcoming October issue of Previews.